To state the obvious, clients are the lifeline of law firms. 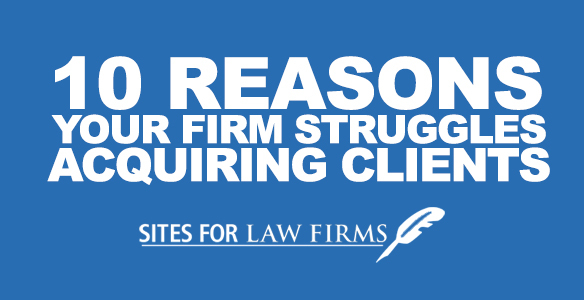 Without clients, you don’t have a firm. If you find that your law practice is having a difficult time obtaining new clients, review the 10 points below and see how you can change your firm’s current predicament. Focus. Focus. Focus. In marketing there is this saying, “When you market to everyone, you’re marketing to no one.” And yes, this is very applicable to law firms looking to attract new clients. Law firm 1 – A general practice law firm that specializes in startups, discrimination, criminal law, medical malpractice, business law, etc. They claim to be great at everything. Law firm 2 – A discrimination law firm that has subject-matter expertise in employment discrimination. They pride themselves in being the best discrimination lawyers out there. If you chose law firm 2, then you’re thinking like the potential clients you want to attract. Your headshot is very important because it can easily communicate that you know exactly what you are doing. People are attracted to photos and often make decisions on what they see. If a potential client can not imagine the person in the photo winning their case, they will look another direction regardless of your qualifications. Reputation management is more important today than it has ever been. With companies like AVVO, FindLaw, LexusNexus, and Yelp becoming more and more popular amongst the general public, if you do not take the time to monitor these channels and address any negative feedback, it can detrimentally affect your business. It’s not required to live on these review sites, but it’s important to be aware of their existence and check back occasionally to respond to bad (and good) reviews of your law firm. Is your law firm website mobile-ready? If it isn’t, then it needs to be. According to WhoIsHostingThis?, 45% of American adults have a smartphone, and 90% use their phone to go online to make purchase decisions. That means, if your site is not optimized for phones, then mobile users will not be able to see or interact with your website. If they can’t see you online, then they’ll pass over you for a competitor that is online. The cardinal rule to owning a business is identifying who your audience is. That means you understand how your audience becomes qualified to be your potential clients and know where they come from. For example, if you are a law firm that focuses on startups, then you would know that your audience frequents sites like Mixergy.com and are densely populated in various startup hubs around America like San Francisco, Denver or Cambridge. If you were a law firm that focuses on car accidents, then you would set up ad alerts on Twitter to capture anyone that types in “a car hit me”, “just got hit by a car” or any other phrase that would indicate that this potential client was recently involved in a car accident. Find out where your audience is located, harness that knowledge, and redirect that audience to your business. Branding is a lot more than a nice logo, letterhead, stamps, and business cards. Branding is the message that differentiates your law firm from the rest. Why are your services better? Why is your firm uniquely qualified to handle the issue at hand for potential clients? If you cannot definitively answer these questions, then your law firm does not have a brand. Referrals via word-of-mouth are an important source of new clients for every law firm. In fact, it may be the most important source of attracting new clients for some firms. For example, if you are a business attorney and have a successful business owner as a client, the chances that that client has a cohort of other business owners are extremely high. With that said, it’s important to get to know your clients as people. Don’t just talk shop and focus solely on the issues at hand. Attempt to forge a real relationship lined with your fiduciary duty. You don’t have a website. The entire world has gone online. Although, many firms get their business through word-of-mouth, failing to bring your firm online can limit the speed of growth for your firm. Most importantly, it will give the opportunity for competitors that are online to swap up any potential clients before they get a chance to learn about your law firm. Just because you have a website, it doesn’t mean people will automatically come to your site and become new clients. You still need to market your law firm. Unfortunately, without internet marketing, there’s a good chance no one will ever find your business online. This leads us to the next point – poor SEO. SEO stands for “search engine optimization.” It is the process of getting traffic from free, organic or natural listings on search engines. If your existing website is not optimized properly by using the correct keywords and signals, then you’re leaving out an entire segment of your potential client market. Your law firm website is an ad that runs 24 hours a day, 7 days a week. However, if your ad is not seen, then there is no way for it to convert new business. In summary, look into these 10 points and take massive action to grow your law practice. If done correctly by your in-house marketing team or outside law firm web marketing agency like Sites For Law Firms, the momentum will be placed back into your law firm’s favor. Contact Sites For Law Firms today and let us help you generate more client leads.